The best approach to deer management is a combination of strategies which starts with a list of deer resistant plants. Landscaping, and especially deeroscaping,is based on a knowledge of deer feeding habits can reduce or eliminate costly browsing damage. A list of deer resistant plants is invalualbe. Also,use of deer repellents or fencing can also be greatly reduced by choosing aesthetically pleasing deer-resistant alternative plants. If you must plant susceptible plants, only plant them close to the house, or in an already fenced area such as a backyard. 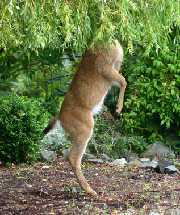 As stated above, the plants deer prefer to eat can vary from region to region and can change seasonally and is dependent on many variables. The following lists have been compiled from research done across the US. There are four basic catagories of plant damage. Rarely Damaged, Seldom Damaged, Occasionally Damaged, and Frequently Damaged. Rarely Damaged: Plants that deer will rarely eat unless there are no other options. These are the best candidates for damage-prone landscapes. Seldom Damaged: Deer sometimes feed on ornamentals listed as Seldom Damaged, but the browsing is usually minor and usually doesn't detract from the looks of the plants. Occasionally Damaged: These are the plants that deer will turn to once their favorites are depleted. Frequently Damaged: Plants that are deer favorites. These are the first plants deer will seek out to eat. These plants often require physical or chemical protection. Plants can be listed as deer resistant for several reasons. The variables include seasonal factors, geographic area, availability of alternative food, taste of the plants, and the deer's nutritional needs at the time. One plant species may be rarely damaged in one region of the country, but highly preferred in another region. Holly, white pine, and deciduous magnolias are a few plants that have very different deer preferences from region to region. Many deer-resistant plants are poisonous at some time of their growth cycle. Many are aromatic, have thorns, or have coarse foliage. 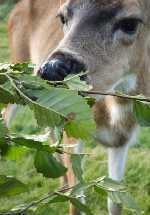 If an adequate supply of natural native plants are available to eat, deer are less likely to browse ornamental plantings. When the natural food supply is low, few ornamental plants will be resistant. Generally, deer browsing is worst in the winter when green grass and green plants aren't found. Also deer browse heavily in the spring on new succulent growth. Have Other Plants to Add To The List? Have you found other plants that deer rarely damage or seldom eat? We would love to add your plants to our lists. Tell us about your landscape or garden and the plants that the deer avoid or love to eat. Please share with us! Do you have a picture to add? Great, that's even better since many people only know plants by site! Click the button and find it on your computer. Then select it. They love my hydrangea, daylilies, and hibiscus! I have tried twice to put Japanese maples in my yard, but the deer eat them very quickly. I've never had them eat my lantana. Plant it every year right it their pathway.